What would our neighboring worlds look like to possible future human visitors? The planets are individual worlds which reveal signs of their histories on their surfaces and in their rocks and ices. Most of the Solar System is fairly narrow in color range with yellow-brown grays of varying brightness and saturation predominating. Often I have had occasion to create images of other worlds, first in paint then digitally. These pages summarise my efforts to obtain color information about the planets and larger moons to assist my portrayals of these places. In essence this is more like an artists note book than a technical treatment which would feature graphs with wiggly lines. Although one can make an earnest effort to 'get it right', there are subjective as well as physical variations in human vision, monitor colors and operating system displays which intervene in any such effort. ( I am using Apple flatscreen monitors to compose this) A discussion of this subject on a quality web forum led to an observation being offered me that in attempting such a planetary color presentation "The target is paradoxically simultaneously shifty (to try to nail precisely) and yet exceedingly forgiving of error." One site run by Bjorn Jonsson, includes some excellent planetary color material. Some of the albedo numbers are referenced from Calvin J. Hamiltons 'Views Of the Solar System' site. Since Mars is a fairly colorful world with a long observational history I have dedicated pages on the 'Red Planet'. The true colors of Mars is a subject a variety of people interested in the planet are attentive to, and with more data coming in from Mars than ever before the prospects for new information on this topic are bright. The planets and their moons are bright and dark, colorful and dull. 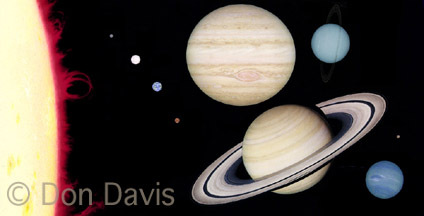 Variations of color and brightness distinguish many of the bodies of the Solar System, and a few stand out as unique. The brightness, or percentage of the light reflected from a world (or sample thereof) is expressed as its 'albedo'. In the images I have tried to correctly color balance the image and present plausible contrast levels. Where noted, absolute brightness, or albedo, of the world has been incorporated into the images. 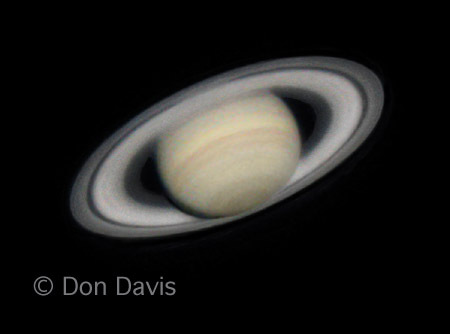 At right is an effort to provide 'telescopic' views of the planets giving something of the visual impression one gets when seeing a sunlit object against a wide black background. This effect is discussed in more detail in the Mars Pages. Earth is a complex world to measure the brightness of, with a calculated average albedo of 0.37. Most of the planet is under an ocean reflecting only about 3.5 per cent of the sunlight neglecting specular reflection. Clouds reflect about 78 percent of the light, and about 50 percent of the surface is covered by clouds at a given time, biased toward the poles. Land areas range from a dark 4.3 percent for forests and about 7 percent for vegetation rich ground such as fields to 13 percent for arid rocky regions.Only the brighter and higher altitude regions are largely free of the blue overlay of the atmosphere. (Some of these figures are from measurements quoted in 'Visual Illusions' by M. Luckiesh, Dover Publications Inc. 1965.) The Moon is overall quite dark, with an average albedo of about 0.12. The dark maria tends to be a bit 'bluer' than the cratered highlands, at some 7-10 per cent reflectivity. Local noticeably red and blue regions exist both on maria and highland surfaces.. The highlands reflects about 20-25 percent or so, with very fresh impact craters strewn with rocks and molten glass as bright as 40 percent. (The background gray on this page is set at 50 percent.) These figures are extrapolated from those in Apollo preliminary science reports. Both bodies are shown at their aproximate actual relative albedos and colors. 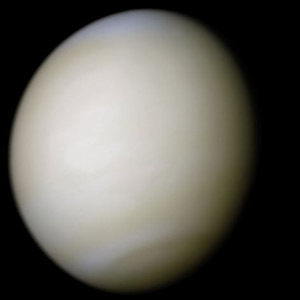 The cloud tops of Venus (left) are visually brilliant white, with a high albedo of 76 percent. Only the faintest trace of the darker tan cloud detail can be detected through telescopes, however ultraviolet images bring out such detail well. NASA image processed by Ricardo Nunes. 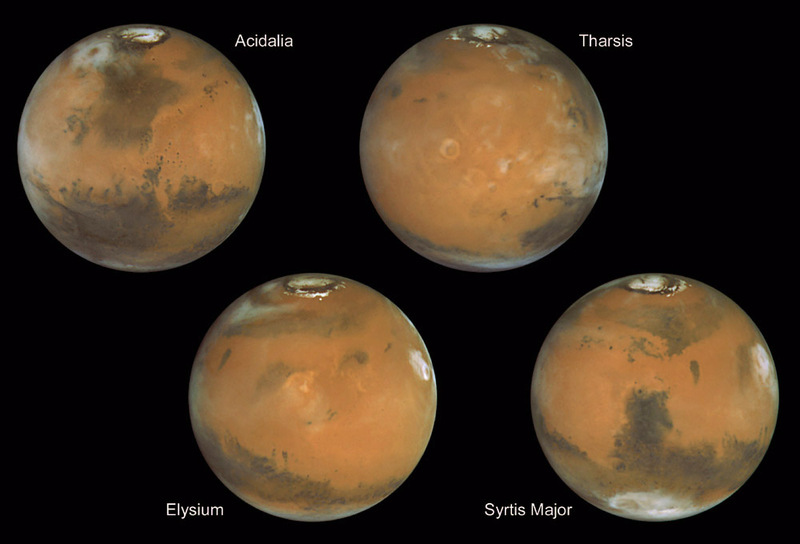 Mars has long been known to be divided between light and dark regions. The darkest areas are mostly exposures of dark gray basaltic rock. The 'desert' regions are a lighter yellow ochre brown. 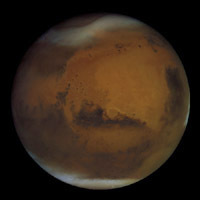 Mars is rather dark, its albedo an average of 0.16. The darker regions approach the color and brightness of the Lunar maria, with the widespread dusty deserts lighter than the average. The image at left builds upon a photograph made at the eyepiece of the Mt.Wilson 60" reflector by drawing over the photograph using sketches and notes made at the eyepiece to capture the visual impressions (top row). The right hand versions are 'darkened' to remove some of the luminous 'dazzle' which is with time reduced in the eye by buildup of the after images of a bright object, giving better visual color detection. A color digital camera carefully tuned to reproduce sunlit darker scenery would probably obtain results similar to the lower right version. Of interest is the more saturated orange coloring of the northern deserts west of Syrtis Major, (the major wedge shaped dark marking extending well into the north.) The southern 'Hellas' basin, in between Sytris Major and the Southern Polar Cap, consistantly appears a distinct yellow to me whenever I have had a good look at it, even in a 6 inch telescope. To the right is a roughly color balanced and albedo adjusted version of Mars, like a 'sand painting' done with actual surface materials. 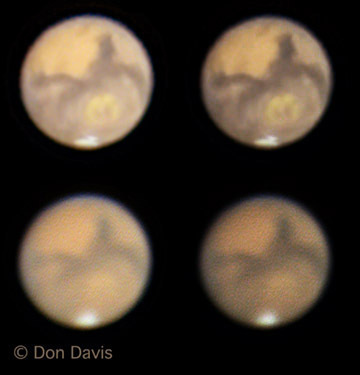 Below is an attempt to do 'fine tuning' color balancing on a series of Hubble Mars images, treating the deserts and dark areas seperately but not adjusting the tonal values to preserve the albedo variations. Clouds and polar ice deposits highlight the planet. I invite those who are interested to visit my page on The True Colors Of Mars. Some controversy has been circulated cregarding that subject, with immense divergences of ways of regarding such problems evident. Jupiter has several narrow belts of distinct colors as well as reddish oval shaped stable cyclonic weather zones such as the 'Great Red Spot'. 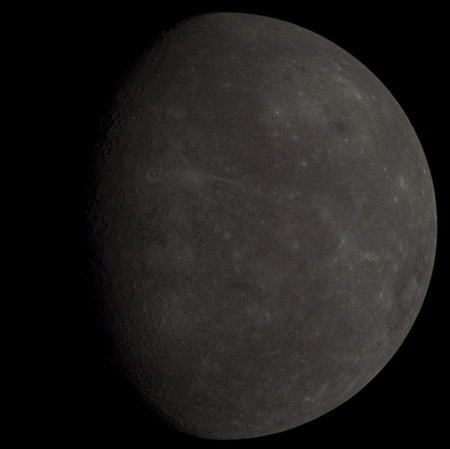 The overall albedo of the planet is 0.52. The colors shown in the strips are of the wider alternating belts and zones extending from either side of the often white equatorial zone. 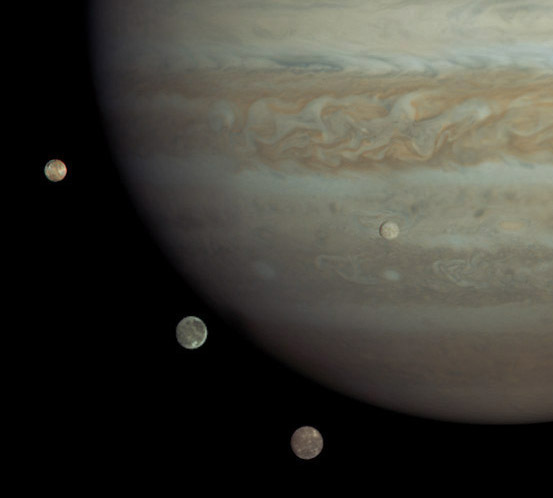 This is a Cassini image assembled from several similarly color balanced images to approximate the colors, contrast and albedos of the planet and four largest Moons ( Left to right: Io, Ganymede, Callisto, Europa) appearing in the various photos. Io should actually be a good deal yellower. 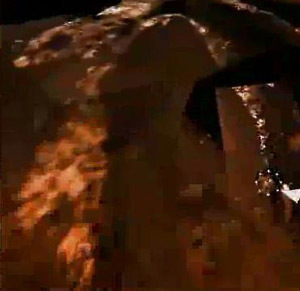 Io, the large volcanic satellite of Jupiter, was first fully revealed in images transmitted from the Voyager spacecraft. Unfortunately their cameras had no red filters and color pictures had to be extrapolated substituting orange for red and violet for blue. In the case of Io this led to a garish 'pizza' appearance with many reproductions of the released images further wandering toward the red until Io looked like tomato soup! Io is very bright, and largely a pale yellow with gray to dull orange regions. Galileo has greatly refined the color information from Io. The albedo of Io, (left, below) is a bright 0.6. That of Europa is 0.64. Ganymede 0.42, and dark Callisto (right) 0.2. This montage has roughly proper color but poorly constrained contrast and brightness levels. Saturn is a more subdued colored world, an albedo of 0.47 making it only slightly darker than Jupiter. The rings are actually more of a brown gray color than we see them from Earth, as we are always nearly 'in line' with the Sun and thus generally see the 'zero phase' region with no shadows and pronounced 'back scattering', all tending to bring a familiar yet atypical white ringed Saturn to our view. At left is my visual impression of a combination of the best moments of seeing of Saturn through the Mt. Wilson 60" telescope. The Voyager spacecraft approached from a different angle than our view and viewed the sunlit rings as they generally appear, darker than the planet. These flybys used cameras with color filters difficult to assemble true color images from, using orange, green and violet filters. A very nice 'Hubble Heritage' natural color Saturn image with realistic contrast can be seen here. Below right can be seen a Hubble space telescope Saturn image including its large moon Titan. Saturn is seen below as imaged with RGB wavelengths by Cassini, with colors and saturation adjusted to approximate Earth based measurements of the color and albedo. Titan, the large moon of Saturn at the lower right of the photo above, is covered with clouds which prevents us from seeing the surface. The color of these clouds is a pale subdued tan with an albedo of 0.21. Photos of this tan cloud enshrouded moon can be found on this page. Measurements by the Huygens probe have resulted in this image being presented as a 'true color' sampling of the terrain viewed on the way down (left) finally landing on a gravelly region apparantly subject to periodic flooding and obtaining repeated scans of the same narrow close up (right) whose colors I bring to rough conformity with the other image. If one were standing there the scene would be at a light level comparable to full Moon, with the colors accordingly muted. If one could strip away the clouds and atmosphere of Titan the exposed surface mught appear something like this extrapolated from measurements from a small region by the Huygens probe as presented above. The wavelengths used for these global views are well apart from visual bands so the tentative nature of such a presentation is obvious. 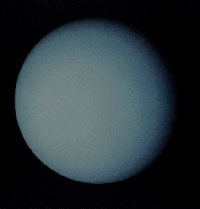 Uranus (left) is a pale sky blue gray, with an albedo averaging 0.5. , as suggested by the treatment of this image.Upon occasion white clouds are seen across the planet. Neptune (right) is bluer than Uranus and has more pronounced but apparently unstable cloud details. At it's distance from the Sun, 30 times that of Earth, color estimates begin to be compromised by the dimness of the light acting near the threshold of human color vision. The albedo of Neptune is about 0.41, with the albedo so adjusted here. Pluto (left) has intriguing surface details, with pronounced contrast between latitudinal zones.. 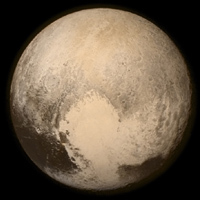 The albedo of Pluto ranges from 0.08 to 1.0! I have made a template to provide some attempt at 'true color' planetary color patches. They are revised and expanded versions of painted color patches I prepared after seeing the Planetary color article in the June 1985 Sky and telescope by Andy Young. I corresponded with the author who kindly sent me color chips which I used as a guide for my own efforts. He is of course not responsible for any errors made here. These are approximate average values but should be 'within the ballpark'. Unless indicated all the colors aim towards a 'naked eye impression' of the color types seen under noontime sunlight conditions or the colors of cloud tops under similar lighting conditions. The color sample should be printed on a high quality printer and ideally viewed in diffused sunlight. 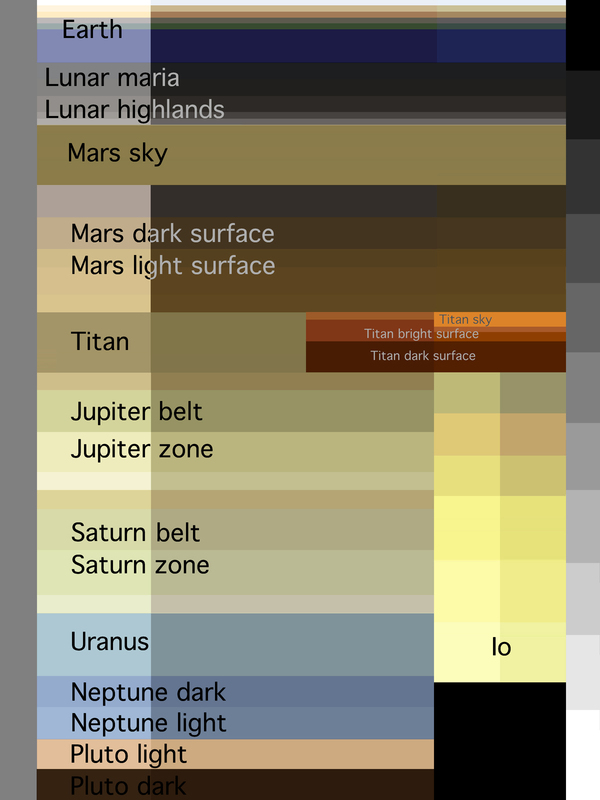 Below is my attempt at a set of color reference strips for some of the planets. Revised July 2008. The left strips suggest the view through telescopes of a small disk against the black background of space, which brightens their appearance compared to having them fill your visual field. The middle portion of the various color strips suggest the color and brightness of planetary surfaces (or upper cloud layers seen from above) under neutral white sunlight. The subtle color shifts of the surface color patches for Mars and Titan on the far right suggest the effects of the ambient lighting from the sky color on the surface surroundings. Some attempt is made to include some samples of typical color variety across the world in question. The 'Earth colors' are in 6 steps in descending order- ice, desert sand, darker deserts, light vegetation, heavy vegetation and ocean. As a departure from the other color samples, the right portions of the Earth strips suggest the effects of contribution of the overlay of the atmosphere to the appearance of Earth from space near the middle of the disk. For the Moon there are 5 steps-'blue' maria, 'reddish' maria, old highlands, fresher craters and mountainsides and 'ray' making fresh crater ejecta Mars has 5 steps under the sky color patch, dark basaltic rock surfaces, moderately dusty highlands, lighter soil, overall dust, and lighter soils and rocks. Titan is represented by first the cloud top color on the left, to the right are 3 steps under the presumed sky color-ice dominated highlands, medium highland and blocky surfaces, and flat darker lowlands. Jupiter and Saturn are given 4 steps-darkest belts, overall darker areas, overall lighter zones, exceptionally light areas. Io with its range of hues is shown with similar convention of telescopic (left) and as if viewing powdered compressed samples (right) Neptune and Pluto have 2 steps shown. Pluto has been updated to show the brightness and color range revealed by results from the New Horizons flyby.